A few weeks ago, you blogged about the conundrum of finding a paper mill selling an interpretation of Steven's poem "Mozart, 1935," which might have incorporated your own work on this subject into it, a remix of your own words. You say, "Is it possible that I would have been buying a hack-job remix of my own article on the poem?" You then go on to say that "I think I would have asked for reimbursement from my university-sponsored research fund for this expense. After all, it would have been research. No? How desperate would a student have to be to use one of these sites?" Anyway, the tone of my blog entry was all wrong, as I can see upon re-reading, and I think threw Kenny off. I find the fact of a $60 50-page paper on Wallace Stevens absurd and I'm not primarily concerned about the fate of my own academic writing in the world of digital copying. Really. I don't disagree with Kenny--as he knows--about remix. I don't fear it and I have very little concern about owning my interpretation of a poem by Wallace Stevens. It was my hook, my start on writing about the topic. 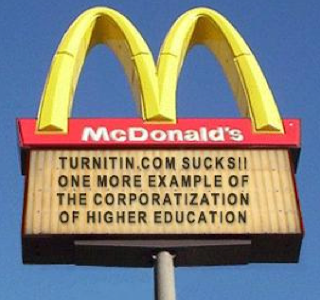 Already not a fan of the grade-giving and grade-getting system of higher education (a view to which this blog amply testifies), I'm bemused by the lack of consciousness and laziness of people in that system feeling the need to pay top dollar for a dumbed-down academic remix. A little bit of work of could have produced the same (I mean even a remix) for free. You see, that's where we begin to see differences between Kenny's uncreative writing course and the paper mills he seems to favor (he doesn't really favor them--imagine him and the purveyors of such a venture in the same room!--but his position necessitates that he be annoyed by people annoyed by them). Kenny's students are (to say the least) extremely conscious of the aesthetic or anti-aesthetic (but that's still an aesthetic) of the sampling, and the violation of conventional values--a violation felt as such by the giant middle on the spectrum running from cool anti-authorial stealing to lazy pirating advantage-taking profiteers--is material for his pedagogy and their learning. He "forces" them to engage in such violation and it's the beginning of their venture into the art world. Kenny and his students, brilliant in their creative uncreativity, are doing one thing, which I admire and literally support. And his world is energized by its all being free. A gift economy thriving on the new digital world in which authorship has happily disappeard. I'm there too. But the purveyors of the paper mill have created something that is the opposite of the gift economy, and the result is an uncreative uncreativity that only very very superficially befits the world Kenny enjoys living in.